Think what you want about Kacey Musgraves, her recent album Same Trailer, Different Park, or even her blockbuster hit “Merry Go ‘Round,” but it’s hard to view her story as nothing less than an illustration of the resounding power of song. Whatever depths of shallowness Nashville’s major labels might be mired in at the moment, one song from an independent-minded artist did the unthinkable. It wound up with a whopping 30 weeks on Billboard’s Country Songs chart and won her a nomination for Female Vocalist of the Year at tonight’s ACM Awards, even before the song’s parent album was released on March 19th–an album that debuted at #1 in country, and #2 in all of music. Beyond “Merry Go ‘Round” and a few other select songs like “Silver Lining,” some distinguishing country music fans have felt there was a little more hype than substance to Same Trailer, Different Park. But nothing can re-write what “Merry Go ‘Round” has done and continues to do. 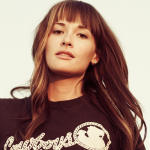 According to Musgraves who appeared on CBS’s Sunday Morning show, she hopes her success ushers in a changing mindset in country, one that offers an alternative to the male-dominated laundry list divel infecting country radio’s airwaves. What kind of alternative? Just a widened acceptance of subject matter, I don’t know — the realization that you don’t have to sing about trucks and tailgates to be a country artist. Kacey also talked about a “younger mindset coming in,” and why this was a good thing, but how just being younger doesn’t necessarily mean being better. Though Kacey was coy, she seemed to allude that even though Taylor Swift had made country “cool,” this doesn’t mean she’s made country better. I do think people like Taylor Swift have opened our genre up to people who wouldn’t necessarily ever listen to country, and it’s made it in a sense more cool. So I do think there’s an influx of a little bit of change. But I want there to be more. I’m not sure why she gets a bad rap from some of the ‘real country listeners.’ She’s has a great sound and is nowhere near as watered down as the rest of the field. I watch the episode this morning and made me like her even more. I first started really liking her when she appear on “Oh Tonight” by Josh Abbott Band. Keep doing what you do, Kacey. I thought she did a really good job endearing herself to folks in this interview. Basically, I think some of the things she says do not appeal to mainstream country’s fan base. Now there is nothing wrong with her saying them, and there is probably a grain of truth to what she is saying. But many “real country” fans have an emotional connection to small town America and listen to country music to celebrate the rural lifestyle. And while many classic country songs by other artists tell sad stories, what makes Kacey’s lyrics different is that she seems to criticize rural America and its traditions in general. She paints with a broad brush, starting with the title of her album, “Same Trailer Different Park”. Taking Kacey’s message to mainstream country’s audience is like criticizing solar power at a Sierra Club meeting or pushing gun control at a NRA convention. The message is wrong for the audience. I’m live in a VERY small community in West TN that is eerily similar to the topics of ‘Merry Go Round’. It perfectly describes the people here. If you’re not married by 20-25, there is something wrong with you according to the folk around you. Why is that? I think it’s perfectly logical to call out the folks who put guilt trips on other for not living their lives like the majority. I hold her in high praises actually for taking a chance and singing about that. I also wouldn’t call it disrespectful. I would say that it’s speaking her mind from her own experiences. At the end of the day, that’s what songwriting is all about. The reason I don’t like most radio country is that ALL they sing about are things that are universally accepted and common in my world. Well that, and that it lacks any shed of substance. Those songs, IMHO, are for those that want to live vicariously in the world of the ‘country.’ I know that sounds pretty arrogant of me to say but it’s true. Same can be said for ‘Time Marches On’ by Tracy Lawrence. Great tune by a good country singer. I’ve said from the beginning about “Merry Go ‘Round” that it includes elements of immaturity and judgementalism that I don’t like. It also tends to simplify certain issues and perspectives. But as Kacey alludes to in this interview, when you start broadening the topics you can talk about in country music, the music begins to open up. A lot of people carry the theory this is how the Outlaw movement in country started, with songs like “Sunday Morning Coming Down” and “Streets of Baltimore.” It started with the lyricism, but then moved to the music itself and eventually to the business end of things. That is the possibility with “Merry Go ‘Round.” It’s still more hypothetical than reality, but there’s promise. I don’t think the answer to cliche songs about pick up trucks, beer, and the military are songs about weed, gays, and scoffing at traditional norms. I don’t see her lyrics as broadening country music. I think it is just appearing to a different narrow base than Toby Keith and Jason Aldean. Trig, I don’t think that you’re allowing yourself to properly judge anything, because on multiple occasions I have seen you use the same terms such as “judgementalism”, and I don’t think anything quite passes that standard. Honestly, I love this site. I love true country music, knowing the history behind it, and the whole she-bang, but when it comes down to it, music can be that way. Music is how you feel inside, and maybe this was not how you grew up, as far as kids and marriage, but it’s music. It is real, and judgementalism comes more from the critics than the artist. I understand what you’re saying Alex, and possibly “judgementalism” is not the exact proper word for what I am trying to convey, possibly because depending on who you speak to, it’s is or isn’t officially a word to begin with. But all I’m trying to say is that by painting small town life as a culture of people who don’t question anything and live in simple, predictable patterns I believe is a little unfair. I for example love the simplicity of the simple rural live. I also believe that “Merry Go ‘Round” is a pretty profound song. I’m a Kacey Musgraves and “Merry Go ‘Round” proponent. But I also understand how the way the song sort of looks down its nose at some people could be off-putting. It worries me that he got an ACM nomination based on one single. I can’t help but wonder if it’s just an attemp to placate the traditional country fans or get everyone on board with Kacey & then manipulate her sound later, make her another industry puppet. Which sounds very conspiracy theorist, which I’m not. It just feels like there’s some motive there. I know Merry Go Round did great on the charts (and I love it), but still. Anyway, I just hope she stays true to her style & grows in her talents. I’m gald her music is out there, that she’s an option. She sure beats the uninspired drivel that’s been pumped out of Nashville lately. I am eager to see how her career unfolds. She not going to win Female Vocalist, and I agree it was a stretch to nominate her. But it was an even bigger stretch by the CMA’s to go outside the genre to nominate Kelly Clarkson. I’d rather see them give the attention to an up-and-coming country artist. In the end, it all speaks to the female talent vacuum at the top of mainstream country. I think of the Kelly Clarkson nomination as a recruiting move. The Nashville establishment wants Kelly, her fans, and her revenues to be part of the “country” community. She has a good voice, fame, small town Texas roots, and the Reba connection. I don’t think most of the music she has released belongs in the country genre, but she would be a big improvement over Taylor Swift. Agreed, that Kelly Clarkson thing was ridiculous. I figured it was just because she performed that song with Vince Gill. I didn’t mean “worried” about Kacey’s nomination. I used the wrong word. Curious is more of an accurate word, I guess. I wouldn’t be upset if she won (though I agree she won’t). I would cheer if she did. It’d be indicative of a good direction in my opinion. I do wish the timing of her album release would have been different. There’s a whole year of waiting now to see how she fairs in next year’s award nominations as an artist who has released an album and multiple singles. She seems to have her head screwed on right. Great family would love to check out her grandfathers record collection. I don’t however believe she is performing tonight which is a shame. You have my sympathies this evening Live-blogging Trigger. I’m thinking the Mad Men premiere is a much better choice tonight. You’re mad of sterner stuff than most of us. I’ll have to check her out. Let’s not start pitting Kacey against Taylor. They’re doing different things and are both talented. Kacey is a Taylor fan, as evidenced by her twitter and a few interviews. I agree it is not fair to pit these two artists against each other, but I think Kacey’s point is important, that bringing in new, younger fans is not enough. That country also needs to start focusing more on substance and the new themes Kacey is attempting to introduce. I think the idea that she is somehow being brave in the face of Nashville conservatism is just a manufactured controversy. So she thinks being a lesbian is fine? Well Taylor Swift and Carrie Underwood. I think she is a very talented songwriter, but I don’t see anything edgy about her lyrics. I hate to date myself like this but, much of what is written and said about Kacey’s songwriting and influences and such remind me very much of what was expressed about K.T. Oslin back in the late 80’s.